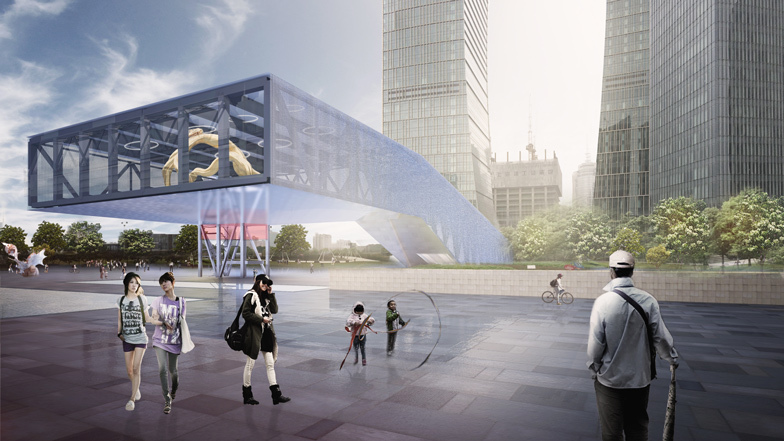 OMA of Rotterdam has won the competition to design an Exhibition Centre in Shanghai. The project site, occupying the former ‘Shanghai Shipyard’, has a long history of marine industry. The new Exhibition Centre is positioned on the ramp of a former ship cradle and provides a concentrated event space within the surrounding financial district. OMA was appointed by Lujiazui Central Financial District (Phase II) Development Corporation to design and execute the building in November 2014. The Exhibition Centre is expected to be opened to public at the end of 2015. The Lujiazui Exhibiton Centre is located on the northern and most recent development of Shanghai Pudong, along the Huangpu River, one of the most photographed waterfronts in the world (OMA).